Last night we had pork hash for dinner and although I really like it, the leftovers I packed for myself to arrange into a bento were just never meant to be eaten by me. I put the piece of it into my bento box and left it on the counter for when we went home. My nephew got a hold of the box and eventually it ended up crashing and the ball of pork was on the kitchen floor. Since they just got their kitchen renovated, Mr. Pikko said that it was still ok to eat. 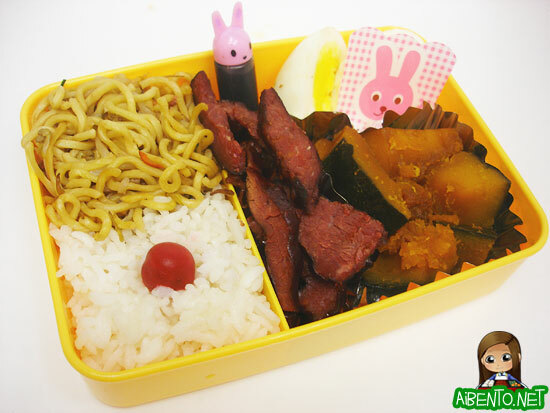 I packed it up again and we went out to the car to leave and I put the bento box on the dashboard. The car is on an incline so it slid down and plopped open on my seat, tossing the meat out. I picked it up within 3 seconds, so everyone agreed it should still be okay. None of us knew what tragedy would occur not even 15 minutes later. We got home and I was trying to juggle one 3 year old, two bento boxes, and Pickles the plushie frog when the bento box suicided out of my hands and landed on the pavement. It was so ridiculously hilarious that Mr. Pikko actually called up his mom just to tell her that I’d accidentally dropped it yet one more time. That pork hash simply did not want to be my lunch today. Back when we had our UFC party I’d defrosted two packs of pipi kaula thinking I’d have to cook another but we had so many hotdogs it wasn’t necessary. I had a pack of it still in the fridge and busted it out for lunch since I couldn’t find any other kind of meat to use. The rice was leftover and the yakisoba is another serving from the freezer. I added in a boiled egg but it didn’t peel very nicely or cut well so I covered it up as best I could with a little pink food divider. In a foil holder I added some simmered pumpkin. I’d bought some frozen pumpkin and just tossed it into a small pot with a recipe I found online for simmered kabocha. It was quite easy since the pumpkin was already chopped into pieces. Very convenient! The pink soy sauce container is for the egg. The box I used is one I’d found at Marukai down here about a month ago. 99 cents and thankfully, made in Indonesia! I have I think 4 of these boxes, I’m not sure. Yellow, pink, green, and blue maybe. Not positive about the blue. They come with a cute fork though! Not sure if I mentioned it before, but I bought adventuresinbentomaking.com in case I ever want the domain. Didn’t want someone to squat on it and it was cheap too. 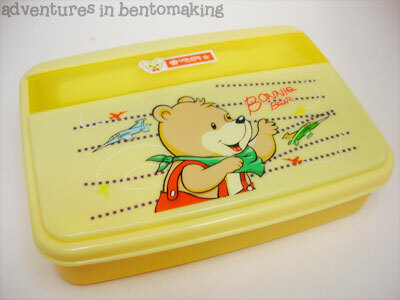 Hopefully now I can work on a page that will nicely showcase my bento box collection!